Hasanlu ~ 9th Century b.c. Hasanlu is the site of an ancient citadel about five miles south of Lake Urmia (Lake Rezaiyeh) in northwestern Iran. The plan on the stamp is based on T. Cuyler Young, Jr.’s plan of the excavations of period IV (9th century BC), printed in Science 135(1962), p. 640. The postal authorities took the plan from Seyed Mohammed Taqi Mostafavi’s Persian Architecture at a Glance, Teheran, 1967, which was reprinted from the article in Science. The plan is not “the oldest ever to appear on a stamp,” as an article in Mercator’s World (1:2, p. 53) says. That honor must go either to Romania 2582, which shows a portion of the Peutinger Table (third century AD), or Israel 693, Jordan 1372, Argentina 1924a, which show portions of the Medaba mosaic map of the Holy Land (ca. 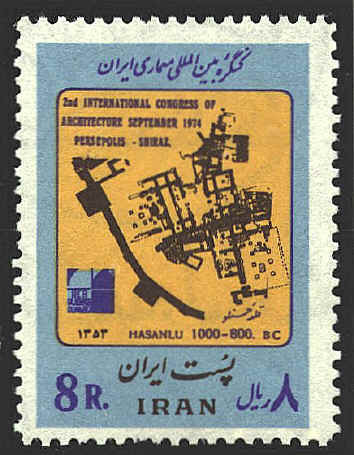 564 AD), Neither is it a plan of the oldest archaeological site displayed on a stamp. That would be the Ggantija Complex (second millennium BC) on Malta 497.